Since the Second World War, the USA and UK have deployed troops nearly every year: Between 1950 and 1991 the USA used or threatened to use force about 500 times. The 1982 Falklands War constituted the 88th deployment of British troops since 1945, in a total of 51 countries. Most of these interventions have occurred in secret. Traditional militarism of the type seen during World War II and the Vietnam War posed various problems for Western elites. During World War II, the centralisation of the economy and mass conscript participation helped to advance the power of organised labour. As a consequence, the “free-enterprise” economic model preferred by corporate business elites came under challenge from progressive working class activism. During the Vietnam War, broad mass movements exposed the aims and effects of Western militarism and challenged the foundations of the social order. The “New Left” exposed the USA as a rogue aggressor state. For Western elites, this became to be known as the “Vietnam Syndrome.” As a counter measure, new militarist strategies were implemented in order to avoid extensive military adventures and their socio-political repercussions. At the heart of what scholar Richard Keeble, in his book Secret State, Silent Press, terms “new militarism” has been the Low Intensity Conflict (LIC) strategy. LIC involves the use of special-forces, secret services, proxy armies, air raids and modernised war technology together with diplomatic, economic, trade, social and cultural forms of warfare which are largely applied in secrecy. According to Keeble, LIC was “developed in response to the perceived threats to vulnerable US strategic interests,” to avoid unpopular “mass participatory warfare” and act without declaring war in order to keep political aspects and gruesome details about conflicts off the public agenda. Examples of post-Cold War LIC policies include the 1990s sanction regime imposed on Iraq as well as US/Coalition “counter-insurgency” policies during the occupation that fuelled a Sunni/Shia civil war and the rise of ISIS. Another more recent case of LIC constitutes Western support for “rebels” in Syria and Libya which also strengthened ISIS and further led to the fragmentation and destruction of the region. Remote controlled warfare, such as US President Barack Obama’s Drone programme, is also an essential part of LIC. Next to secret warfare, new militarism has involved a selected range of major and overt “quickie” interventions against Iraq, Somalia, the Former Republic of Yugoslavia, Afghanistan, and Libya among other countries. These constituted manufactured, media-hyped “operations” against vulnerable enemy states or movements who were depicted as existential threats. According to Keeble “these ‘operations’ are then spectacular, essentially PR, events providing the theatre in which the US and its allies can claim their so-called ‘victories’” – despite the devastating consequences for the target countries which have largely been ignored by the mainstream news media. 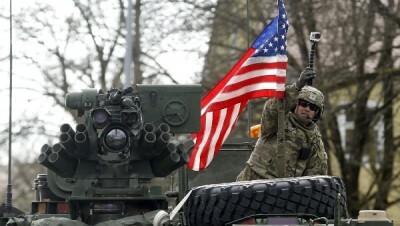 In 2012, annual military spending in the USA had increased to about $1 Trillion (see Robert W. McChesney, Digital Disconnect). Western militarism has been driven by this war economy. The funds invested in the military-industrial complex must be redistributed. The vast military machine needs to be dismantled. This can only be achieved by the concerted and peaceful efforts of an international grass roots movement.